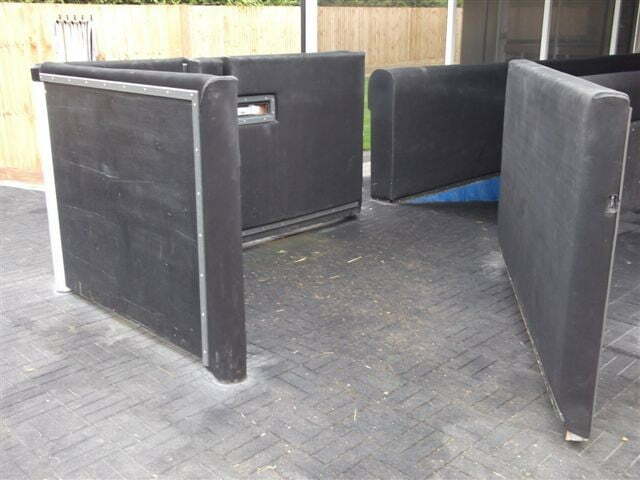 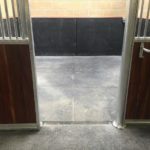 Quattro Products supply and fit high quality rubber flooring to the equine world our most popular being Rubber Stable Mats, Rubber Pavers and Rubber Tiles for Horsewalker’s, Stable Yards and Racecourse’s. 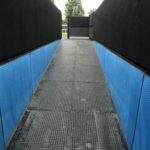 As we are the UK’s largest rubber mat importers and have been supplying and fitting rubber mats for over 30 years we feel we can give the best advice and service on high quality rubber mats and be competitive on price. 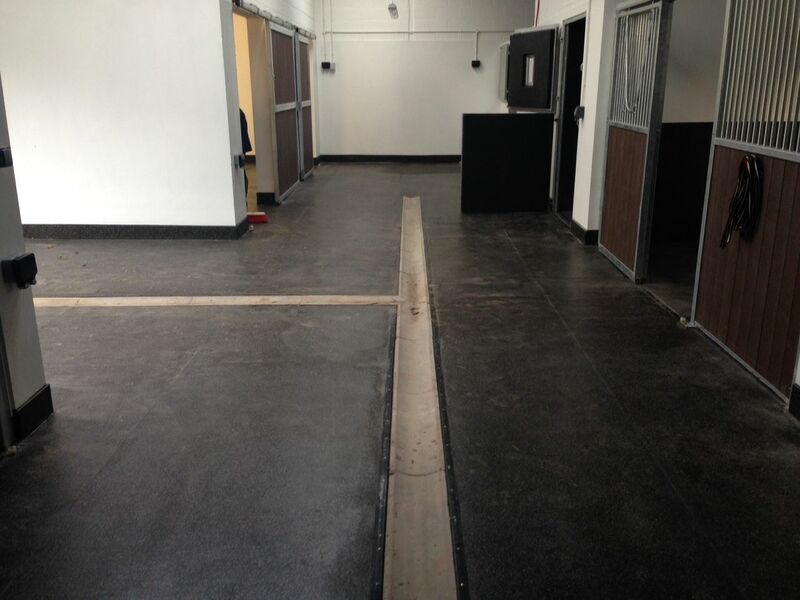 The motto you get what you pay for couldn’t be more fitting when it comes to rubber matting. 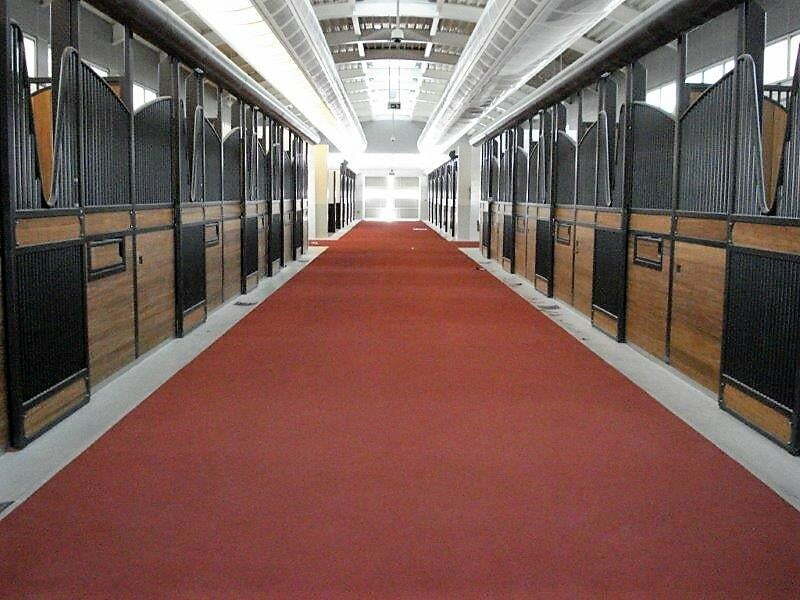 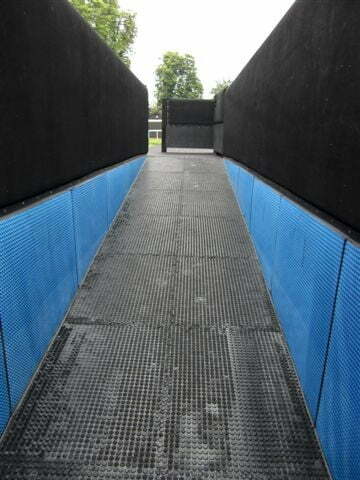 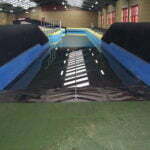 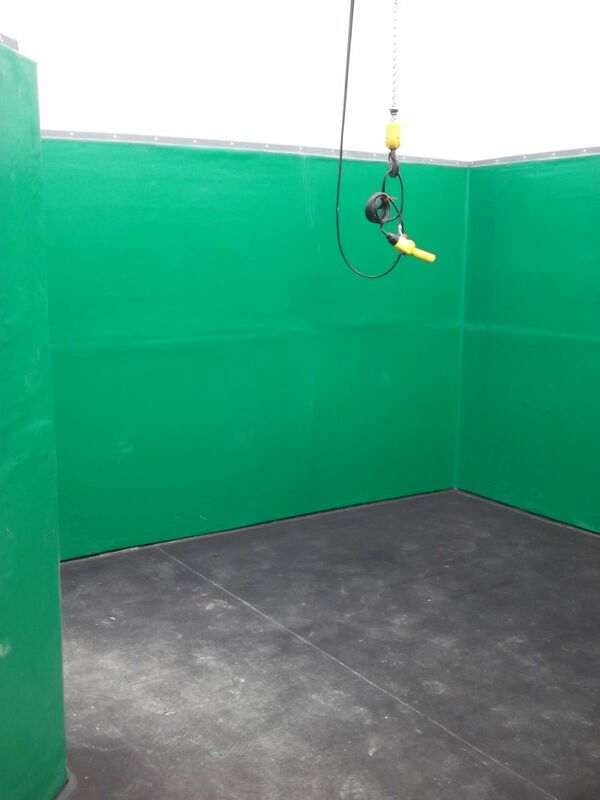 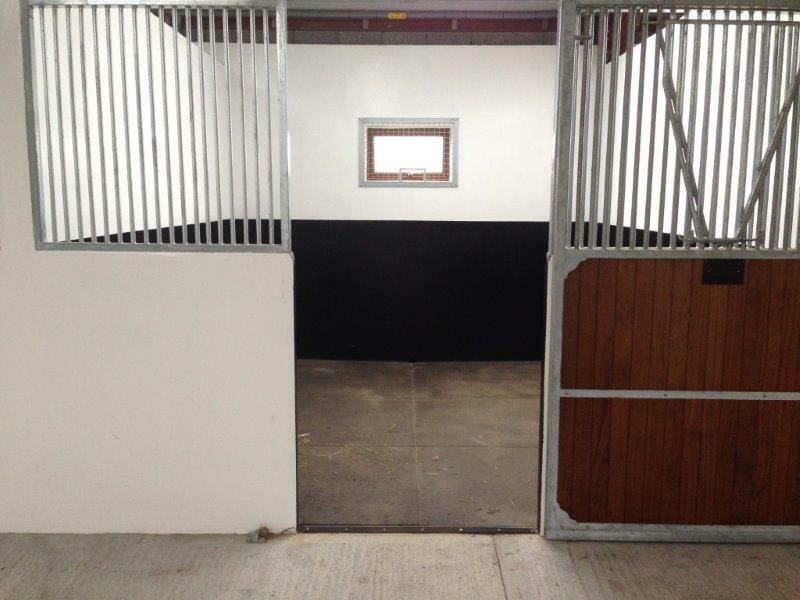 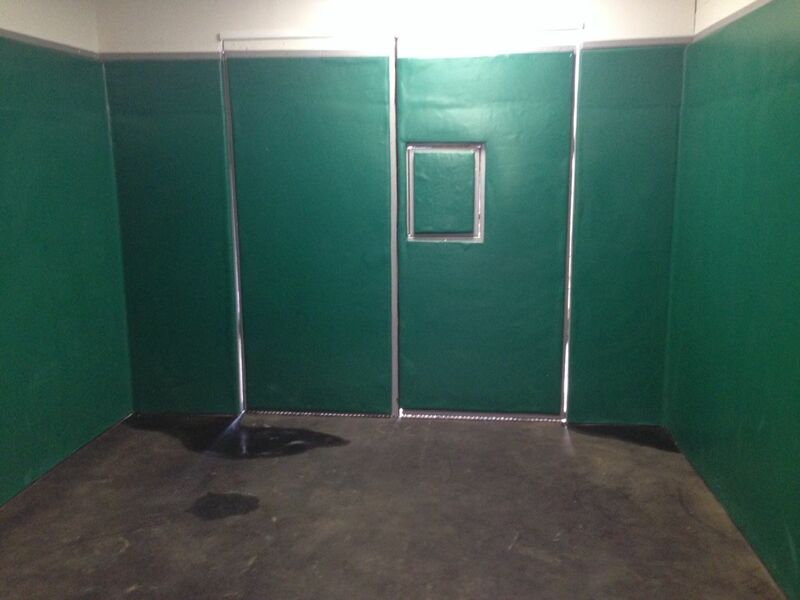 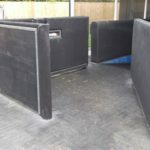 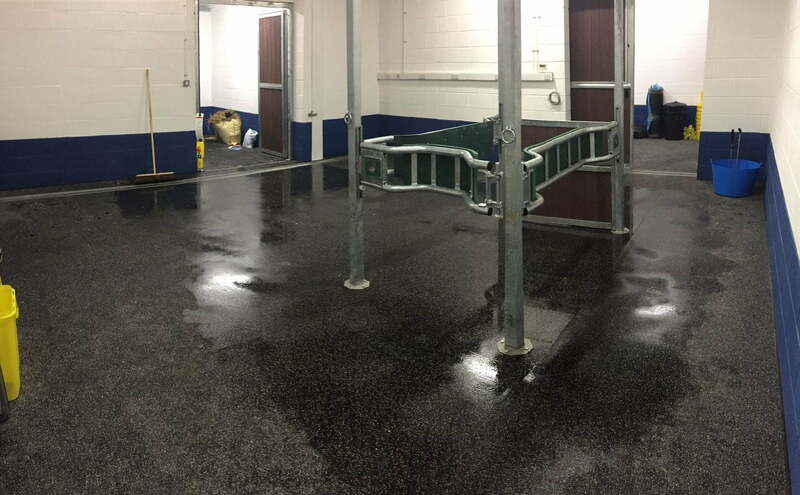 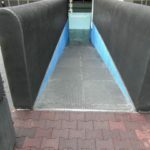 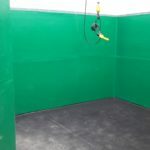 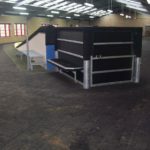 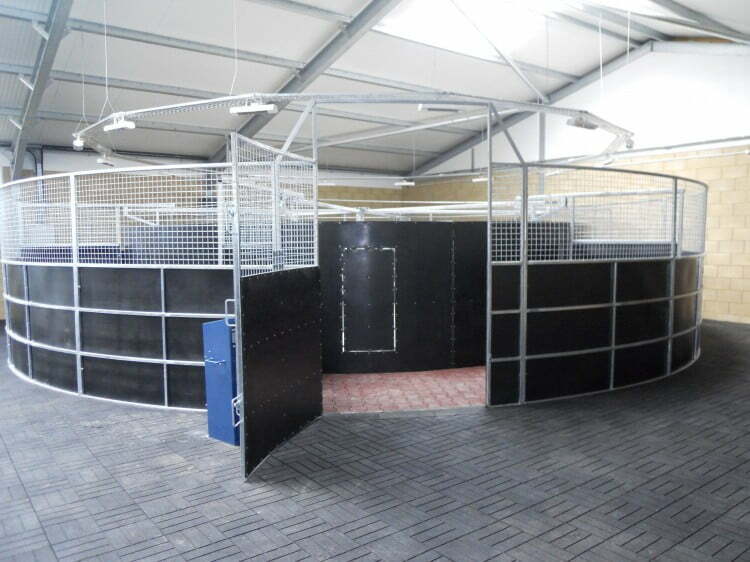 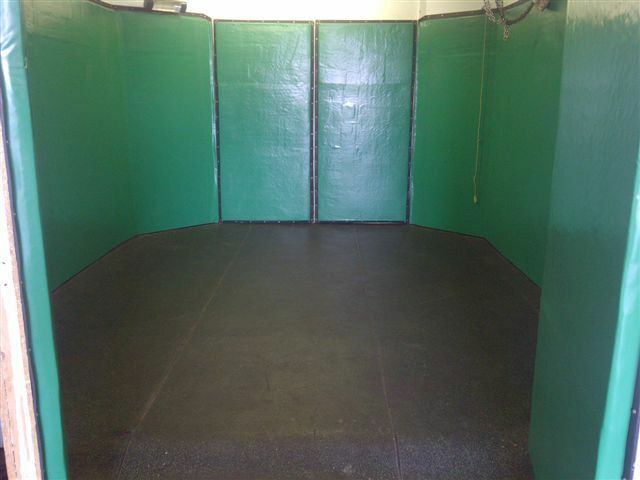 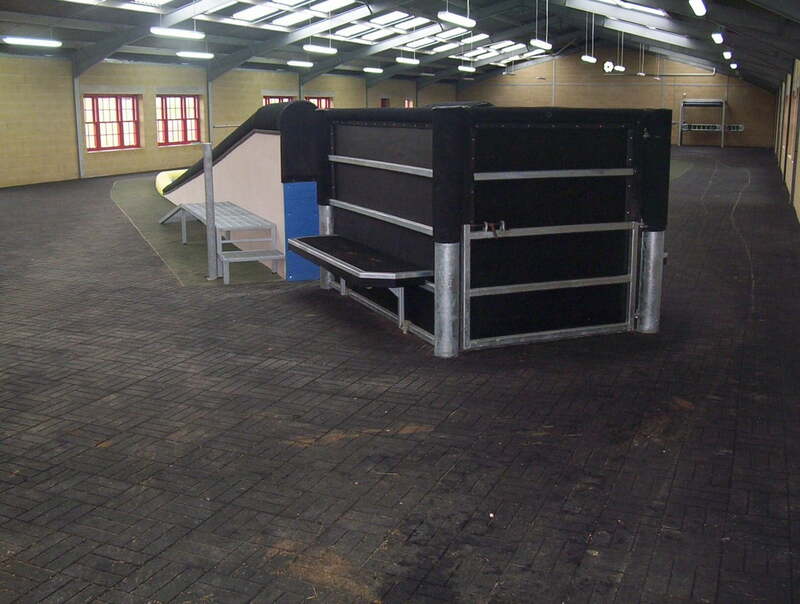 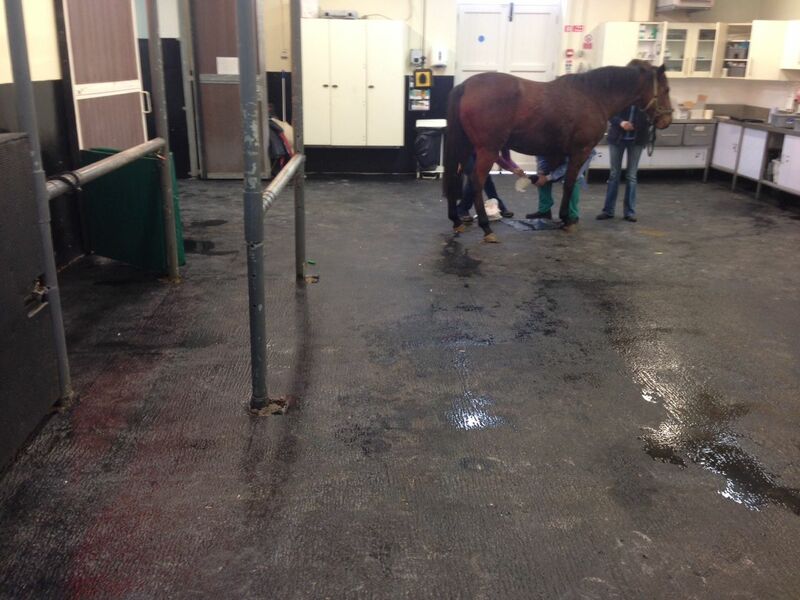 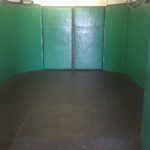 We also specialise in Seamless Trowelled Rubber Flooring, Rubber Matting for Horseboxes and Veterinary Hospitals. 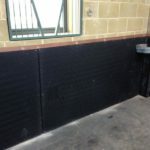 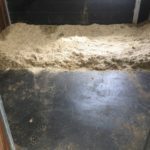 There are so many different types of rubber mats available for stables that it can be difficult to know which is best for you. 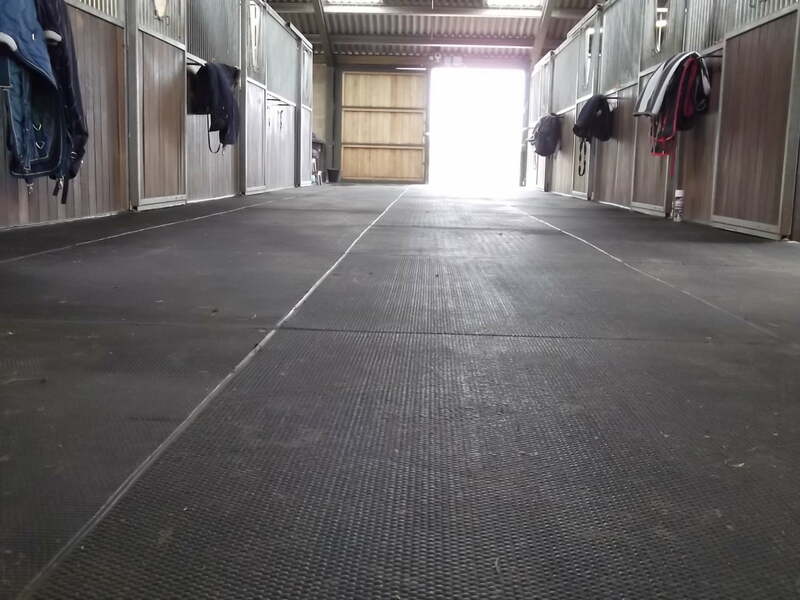 Most suppliers only carry a few different types of rubber mats this can lead to people to purchase rubber stable mats only to find that they are unsuitable for their own situation, some wear too quick, some spread & curl, some hold moisture and urine, others can’t be sealed or bonded. 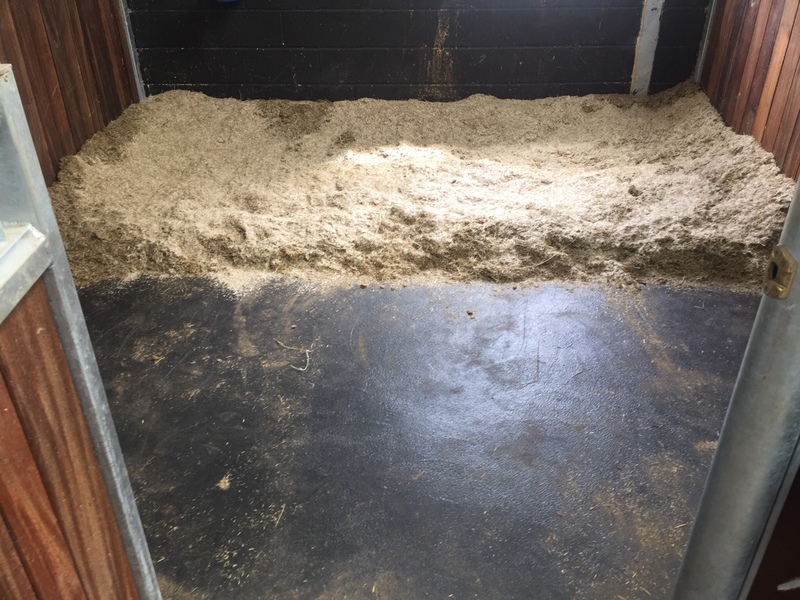 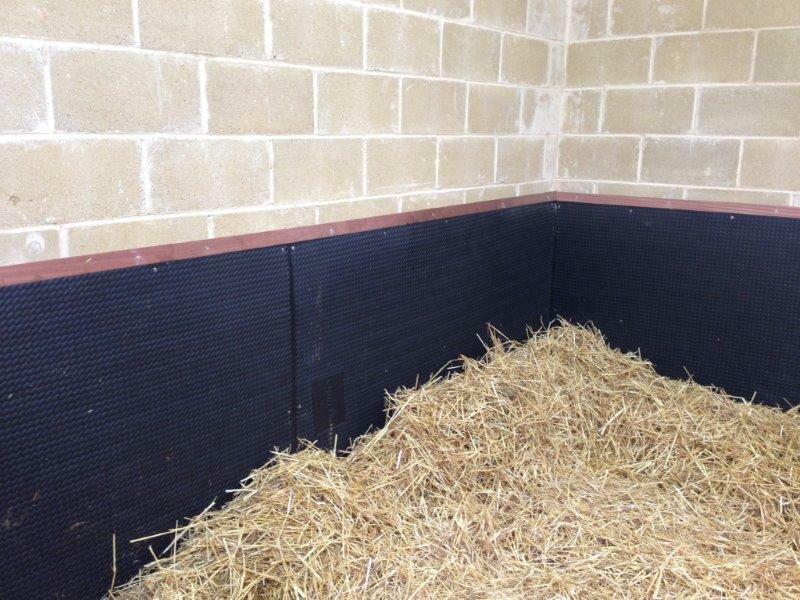 Because Quattro supply such a wide range of rubber stable matting we feel confident that we will have the correct product for your use and the size of your horse. 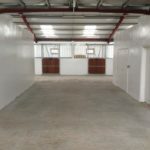 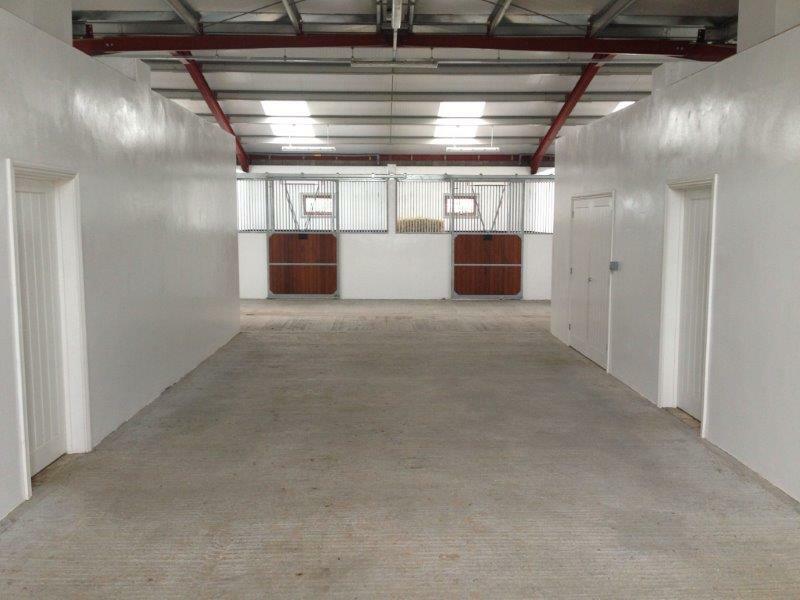 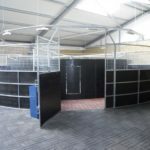 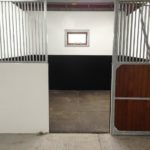 We also supply a full fitting service, we work all over the world fitting stables from a standard 12 x 12 stable to the biggest equine centres in the world, due to this and our experience within the equine world we feel we can offer you the best products and service. 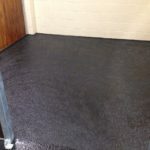 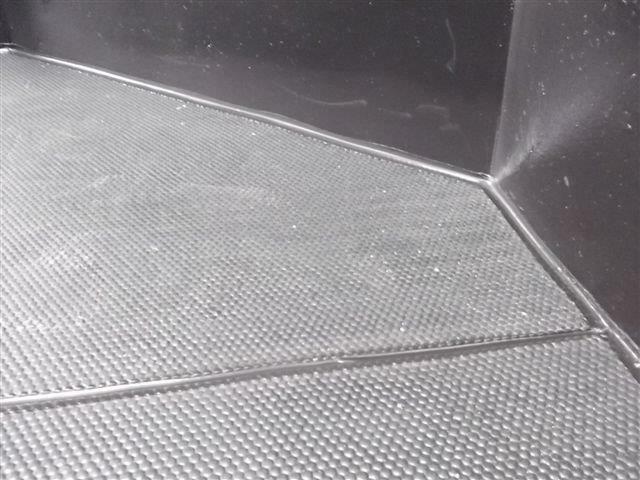 Our most popular rubber stable flooring is the Bonded & Joint Sealed Matting which can be fitted in different thicknesses, densities and surface profiles. 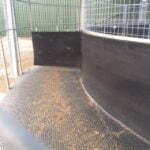 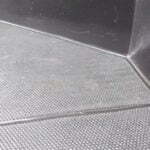 Click here to take a look at some of the rubber mats we have to offer. 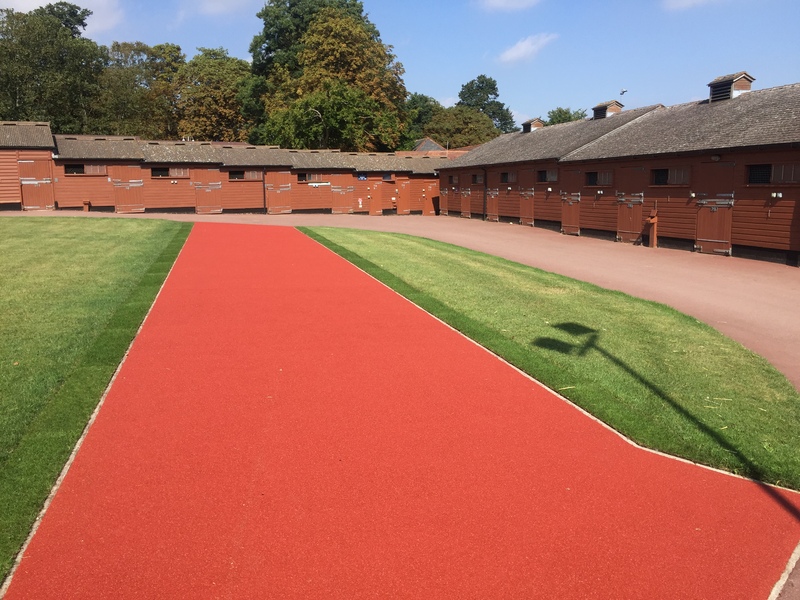 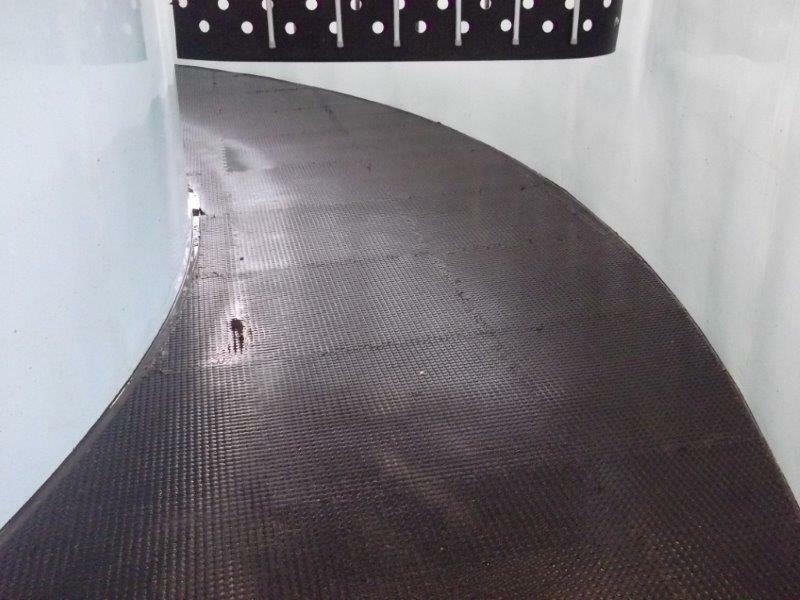 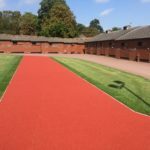 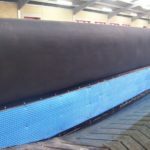 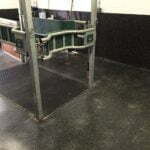 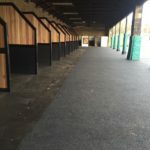 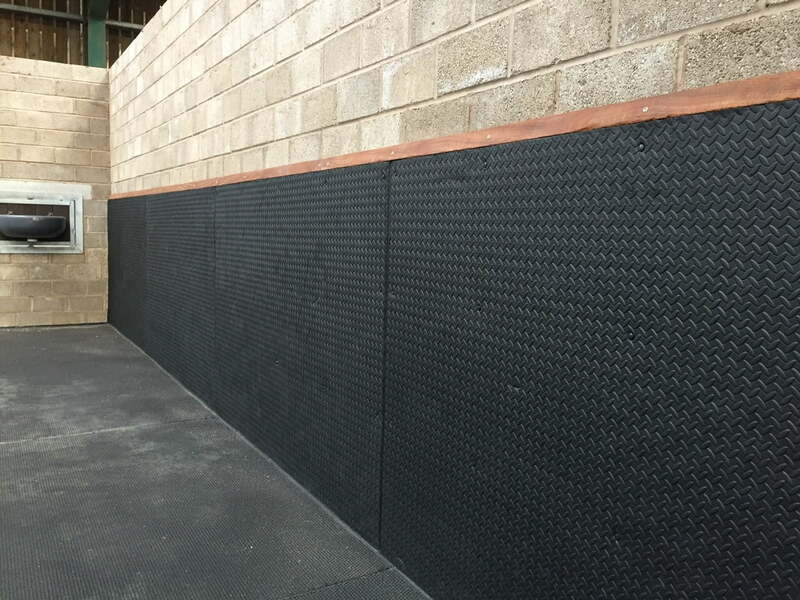 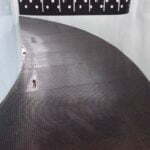 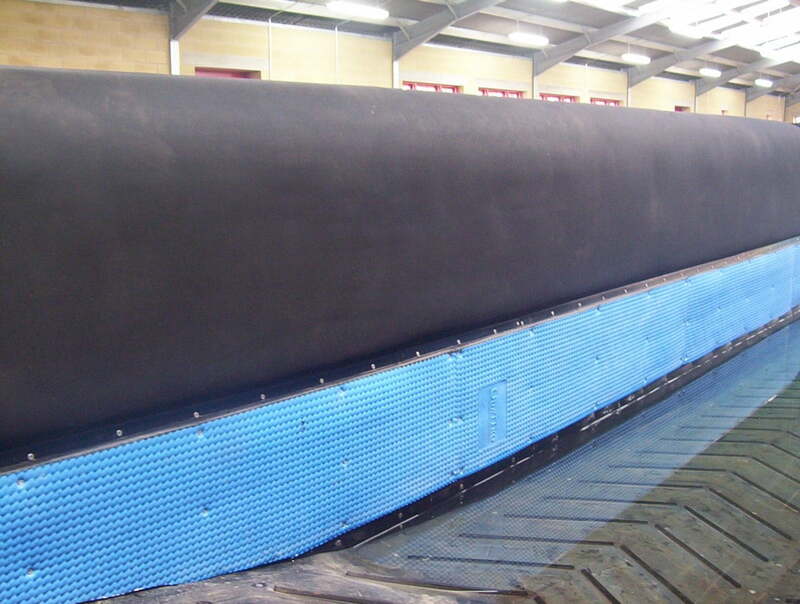 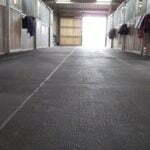 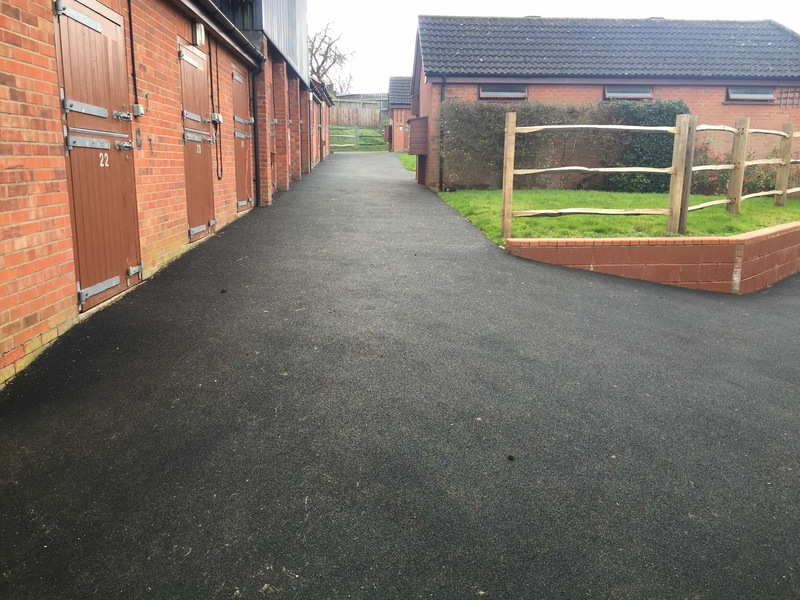 We also offer a seamless rubber system, the high tensile Flexscreed® system is designed as an open or sealed rubber screed ideal for stables, parade rings, horse walks, yards, etc. 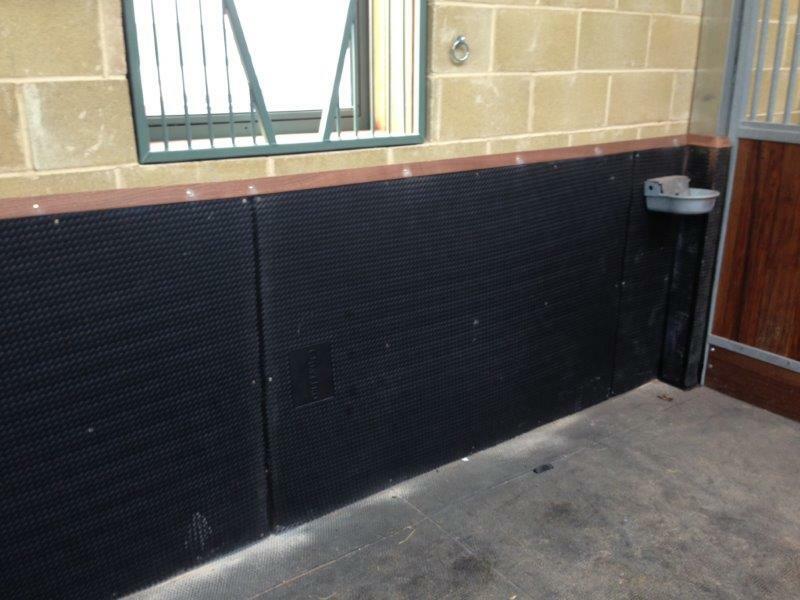 It provides a seamless cushioned protective surface for horses riders and grooms. 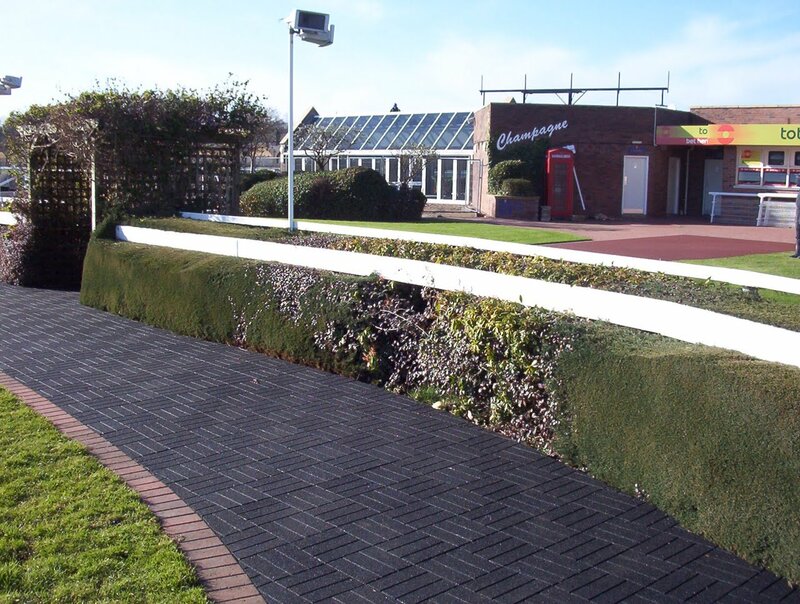 Standard systems are black, colours can be introduced to provide more aesthetic appearances. 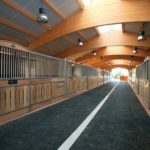 The depth of Flexscreed® can be varied to suit the environment required. 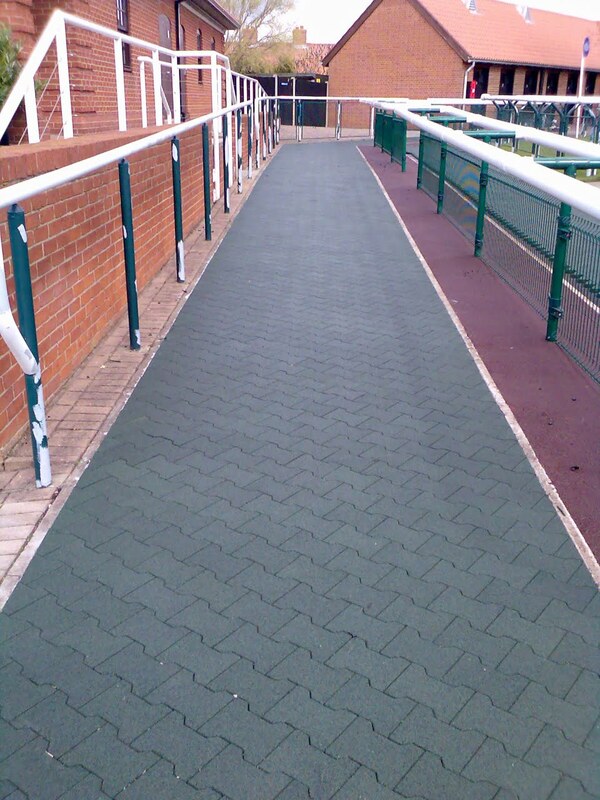 It can provide competitively priced option to the heavier pre manufactured rubber tiles. 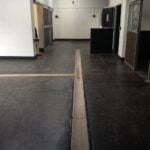 Flexscreed® is ideal to provide difficult shapes and will deal with poor and uneven substrates without the requirement of a great deal of Groundwork’s. 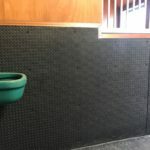 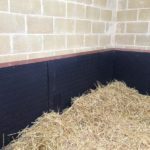 We also have a wide range of products for stable walls from our stable paints Elastect and Q/Tyle to the most popular Quattrosoft Eva Matting which is a soft foam wall padding for wall protection and anti cast and the newest addition to our stable wall range is the Sportsroll this comes in a variety of colours and thicknesses so there is something for everyone. 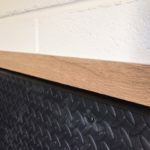 Our team of fitters will cut seal and bond your matting and an edging strip of your choice can be used to finish the look off. 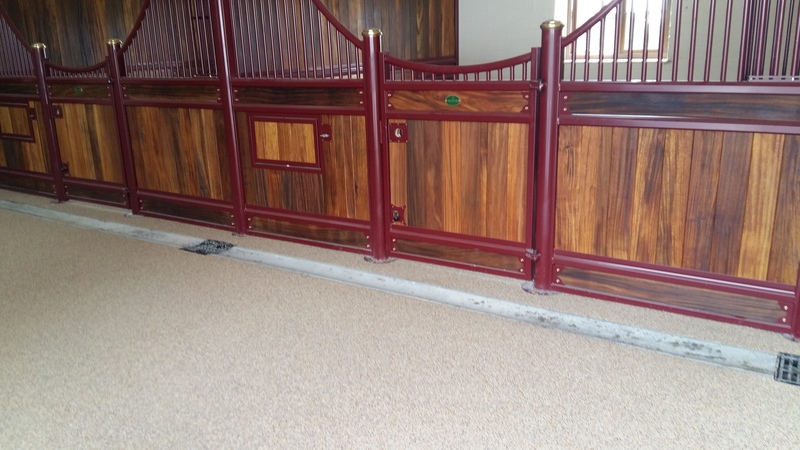 It is important to have the right flooring in your horsewalker so you know your horse is comfortable and safe while exercising. 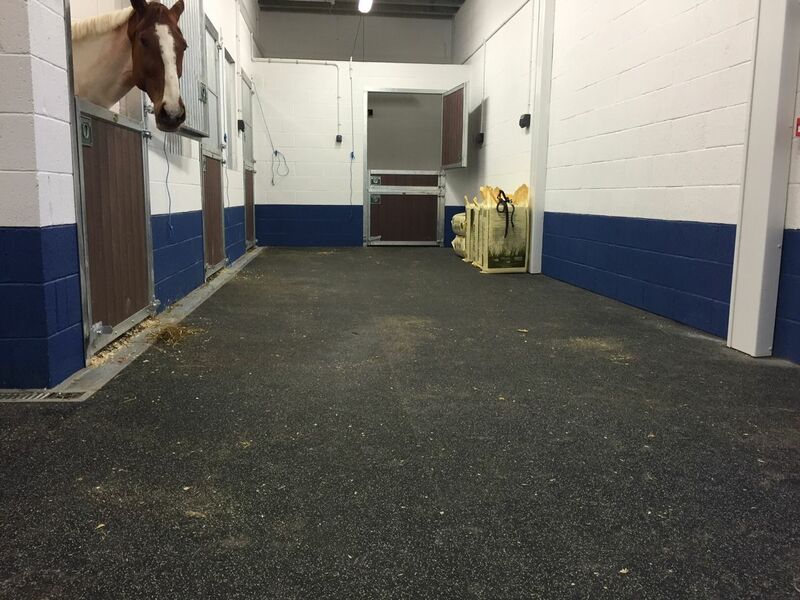 Rubber flooring in horsewalkers has proven to reduce shoe wear and muscle strain as well as providing an anti-slip surface. 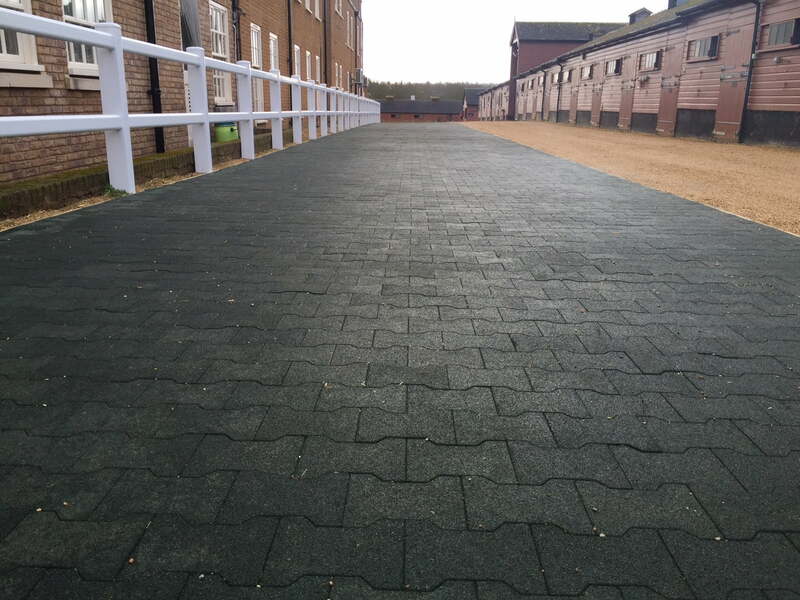 Our teams of fitters can fit rubber tiles or rubber pavers to any size horsewalker. 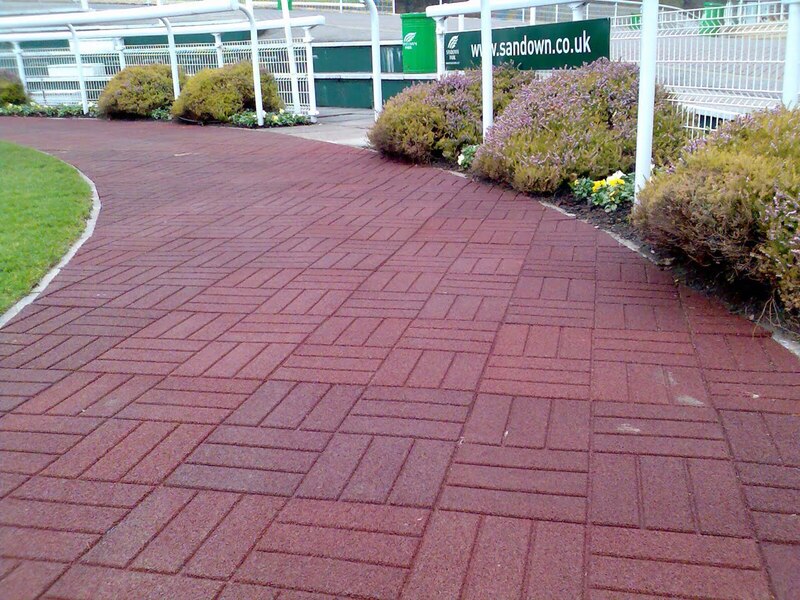 Our most popular surfaces being the super hard wearing Grip Top Tile and the more decorative Hi Density Dogbone Paver. 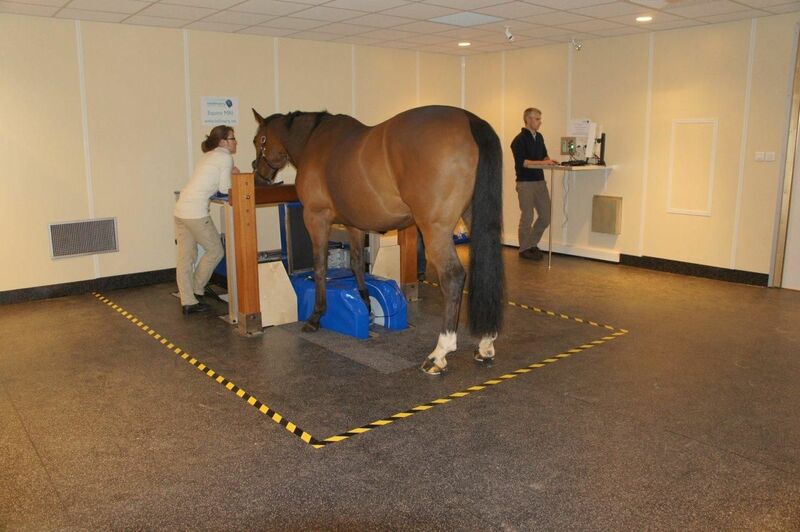 For more information please see Horsewalker Data Sheet. 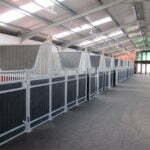 For a free quotation please call our office on 01768 864977 with dimensions of your horsewalker. 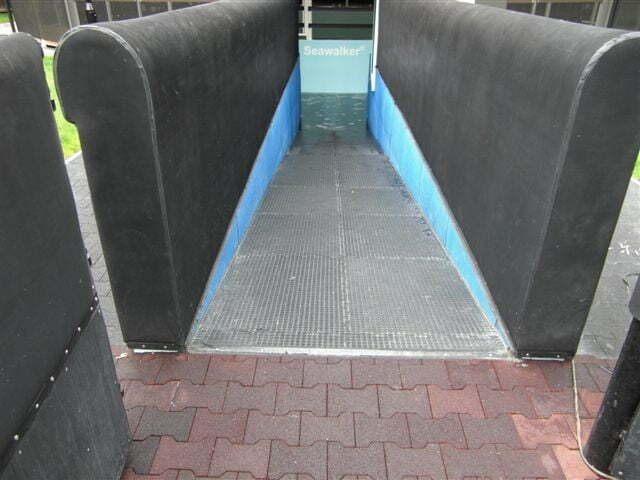 We will require the diameter and the width of the walkway. 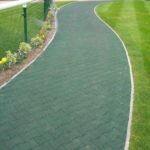 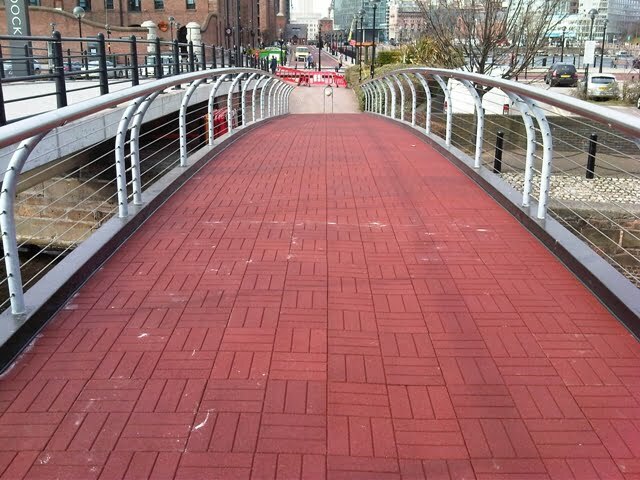 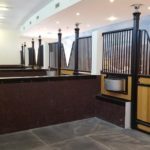 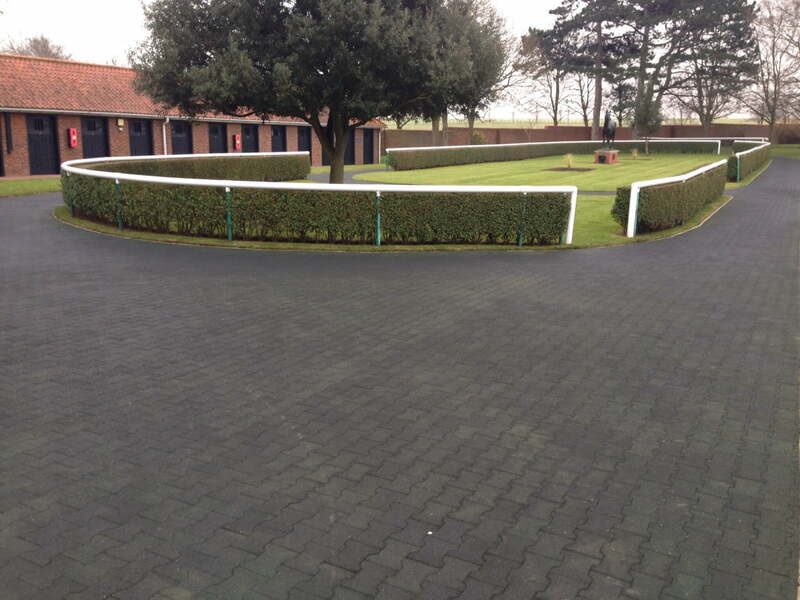 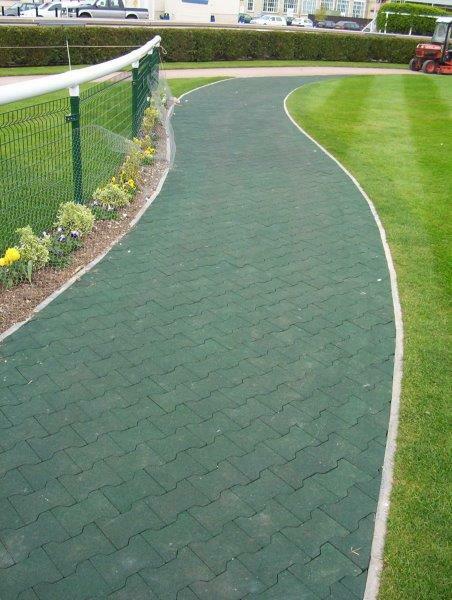 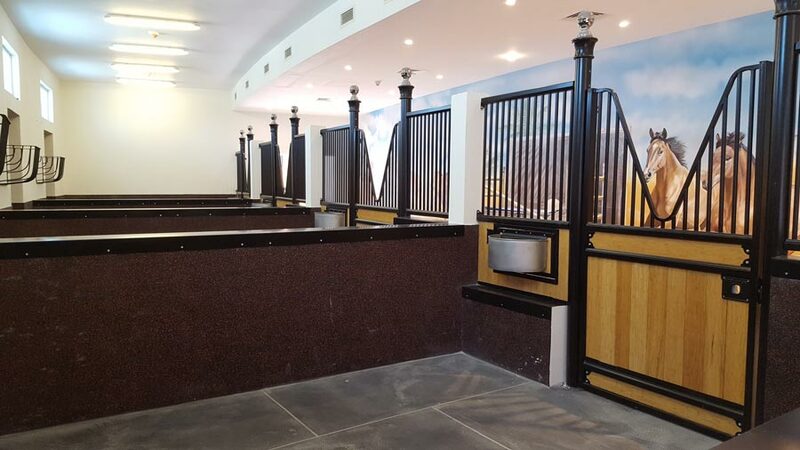 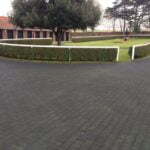 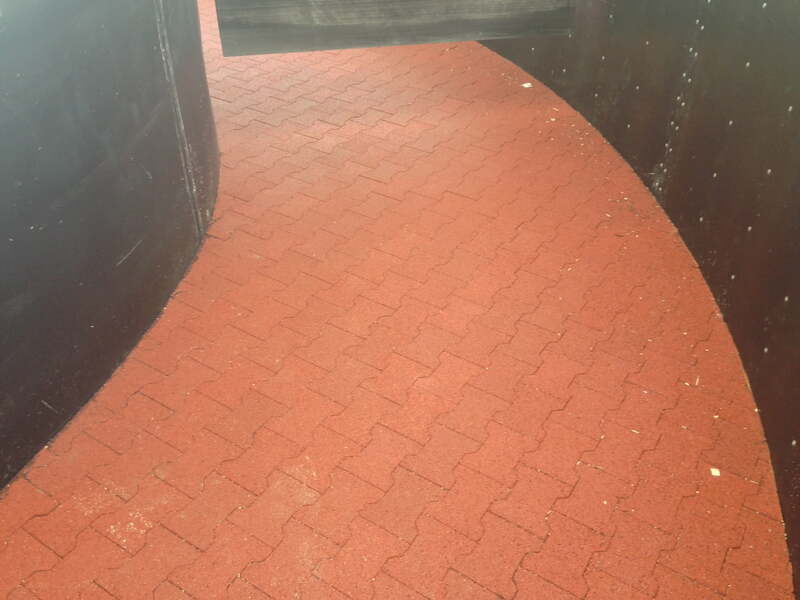 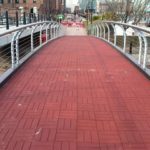 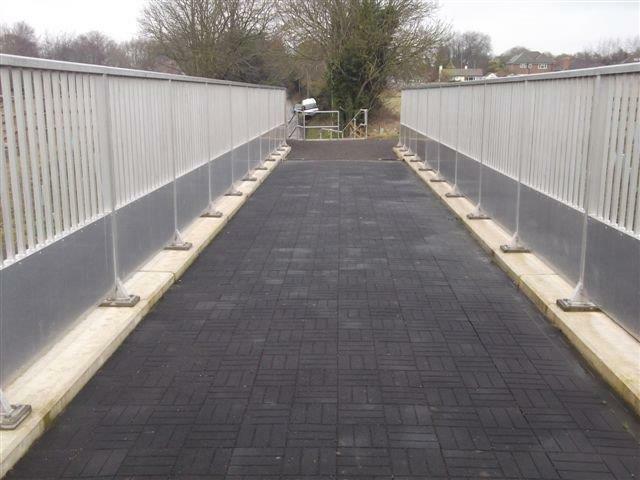 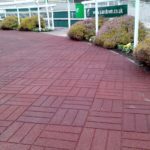 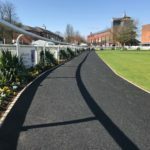 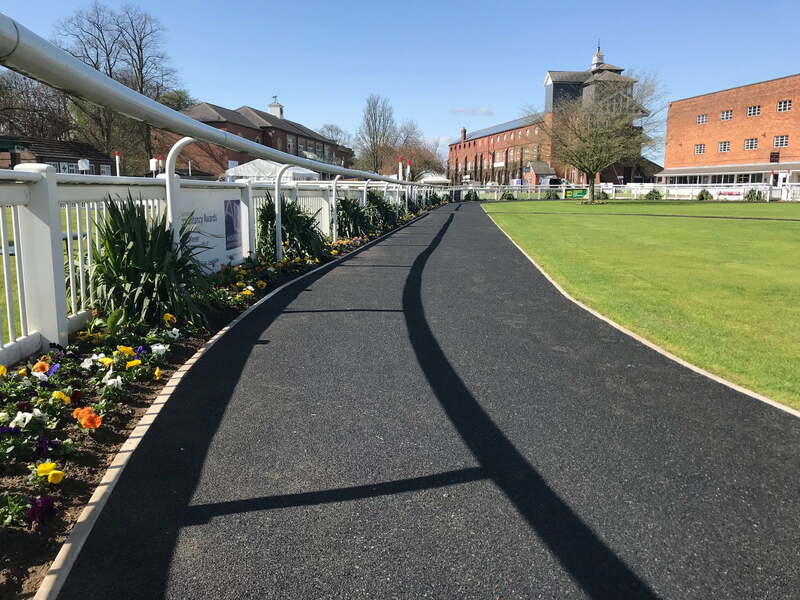 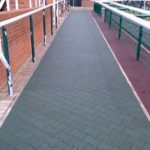 Our Rubber Dogbone Pavers and Rubber Brick Effect Tiles also work and look great in walkways and equine bridges these products are commonly used in racecourses and larger equine facilities. 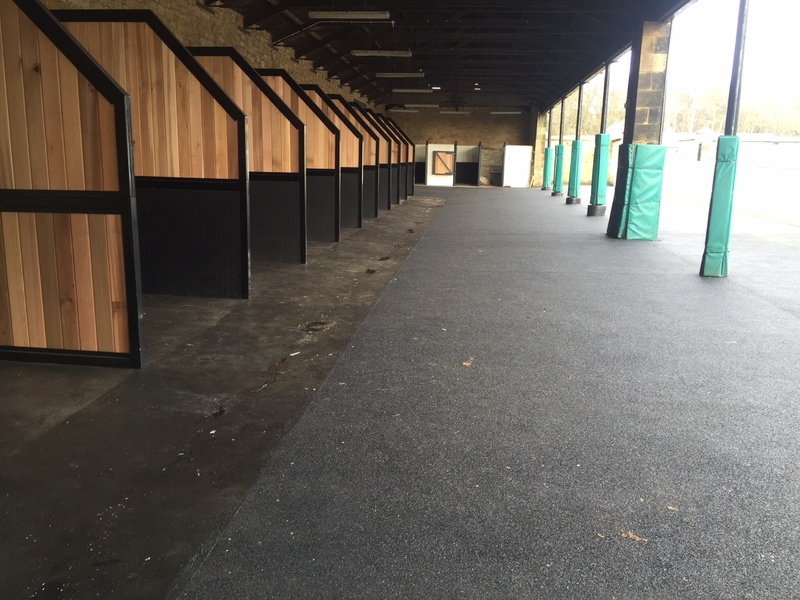 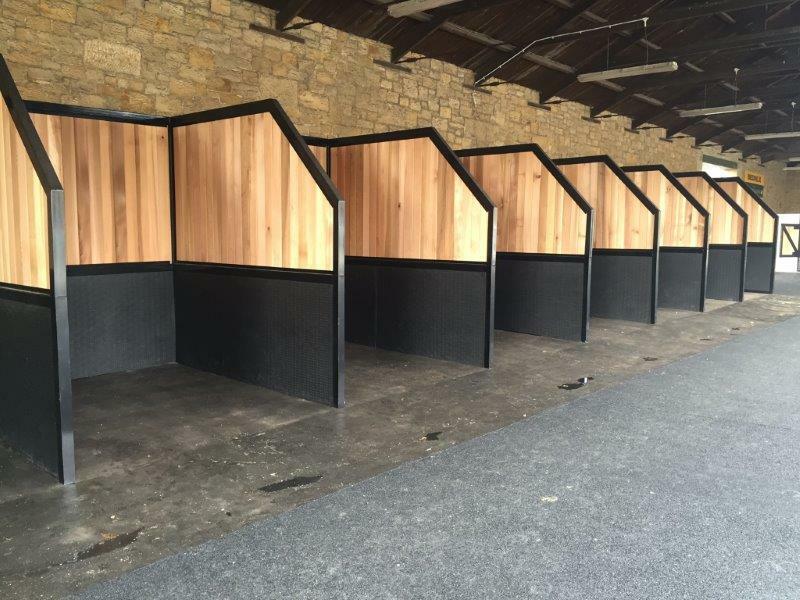 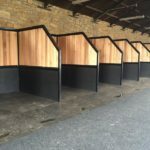 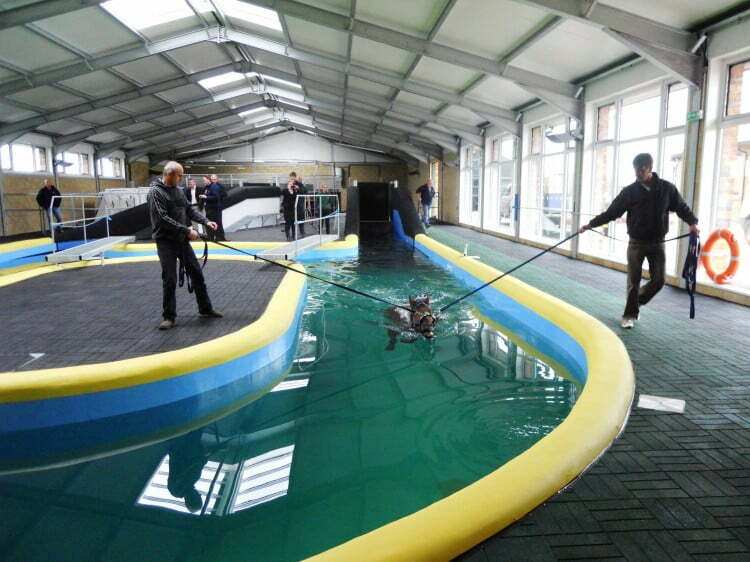 Our team of fitters have worked at some of the best racecourses in the UK and largest equine centres in the world. 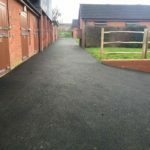 We also offer a seamless rubber system, the high tensile Flexscreed® system is designed as an open or sealed rubber screed ideal for stables, parade rings, horse walks, yards, etc. 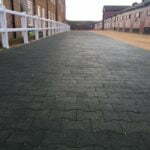 It provides a seamless cushioned protective surface for horses riders and grooms. 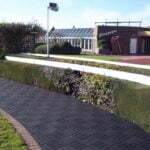 Standard systems are black, colours can be introduced to provide more aesthetic appearances. 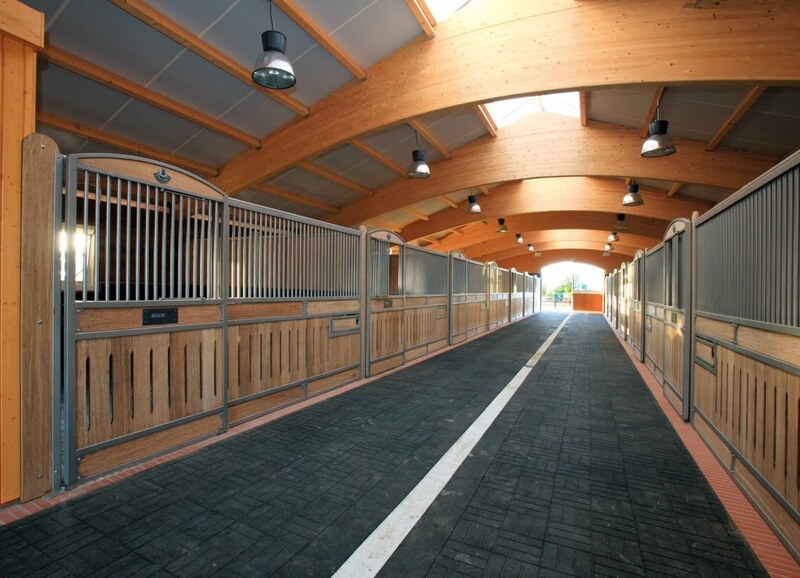 The depth of Flexscreed® can be varied to suit the environment required. 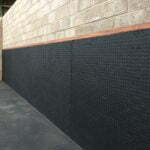 It can provide competitively priced option to the heavier pre manufactured rubber tiles. 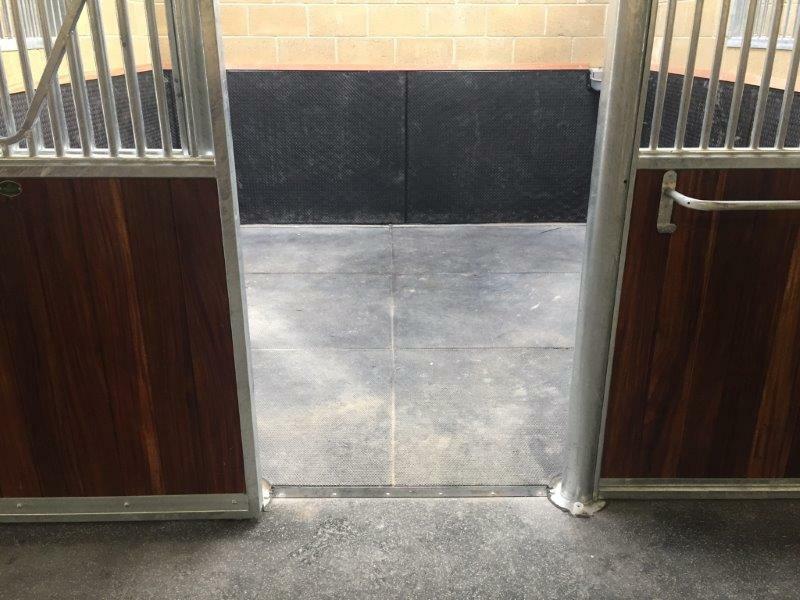 Flexscreed® is ideal to provide difficult shapes and will deal with poor and uneven substrates without the requirement of a great deal of Groundwork’s. 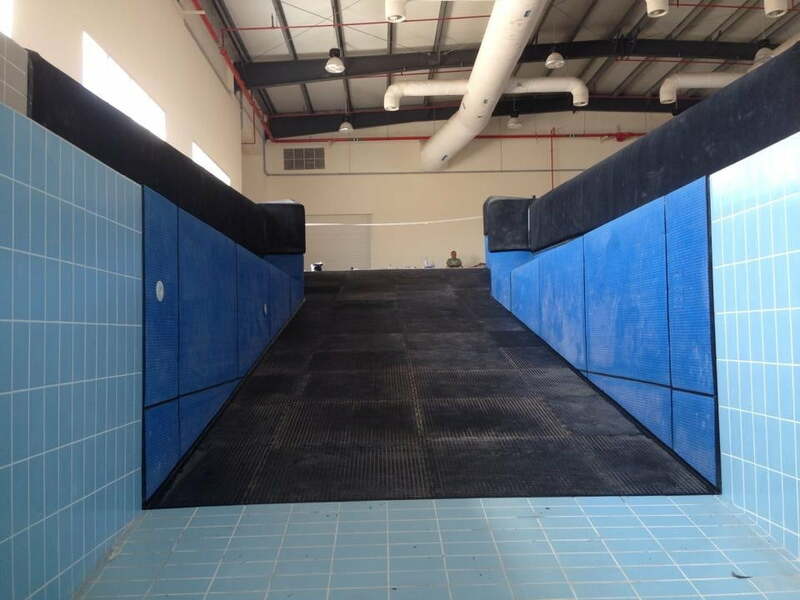 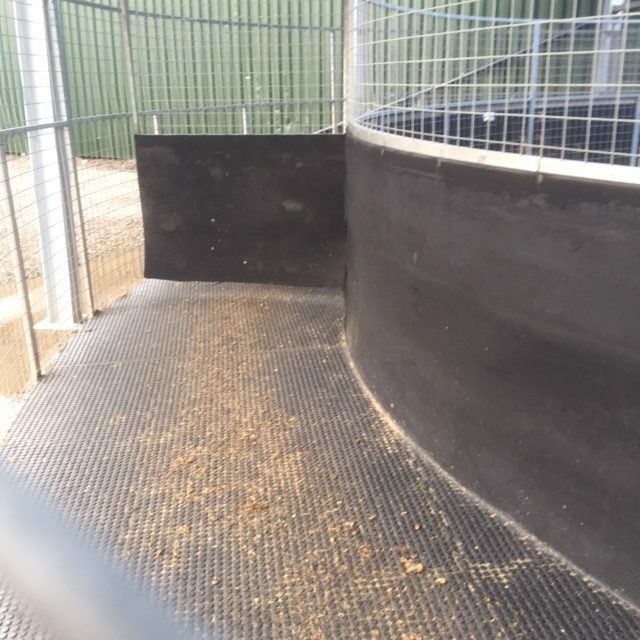 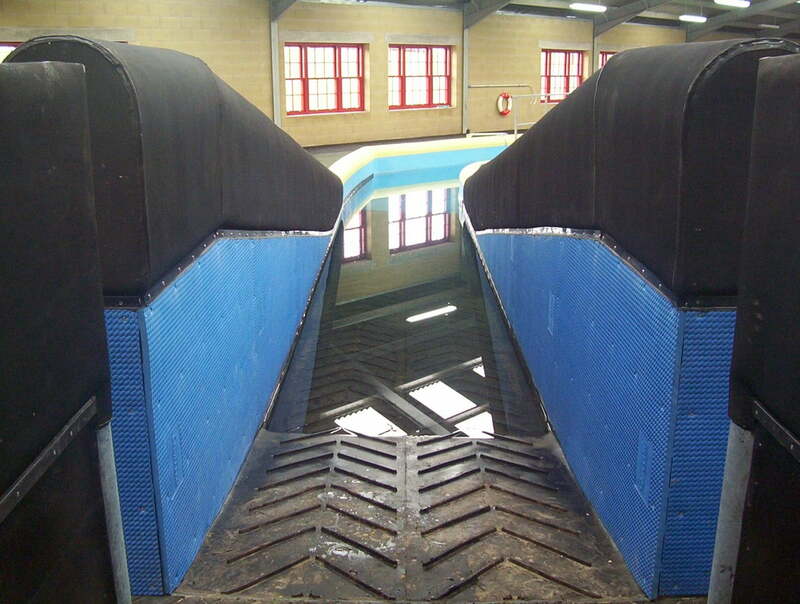 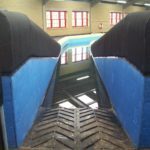 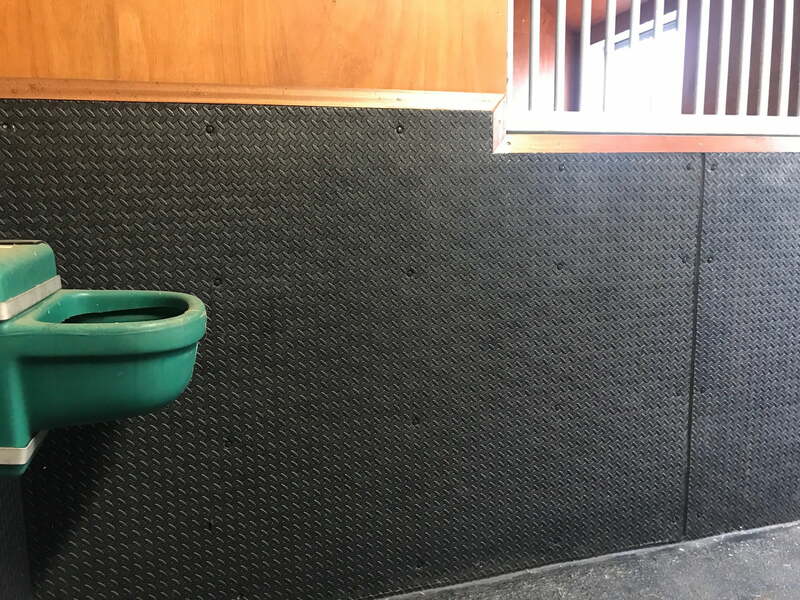 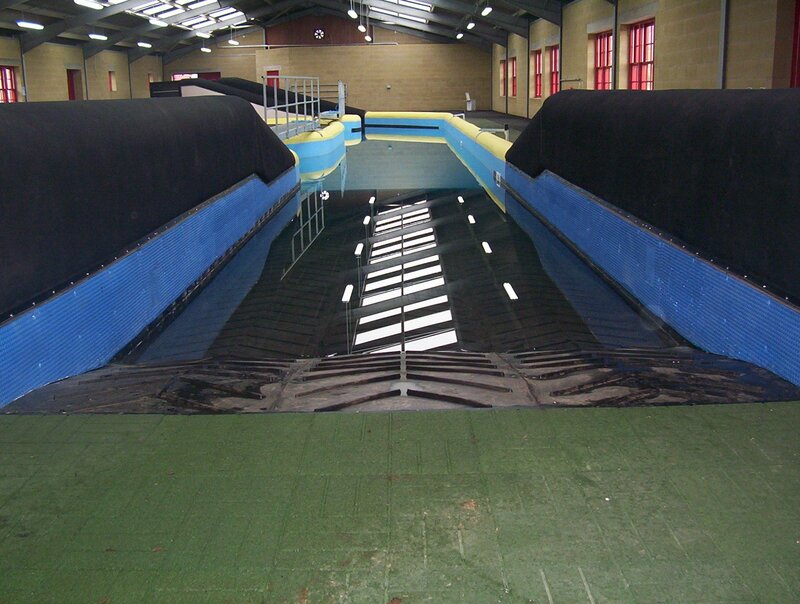 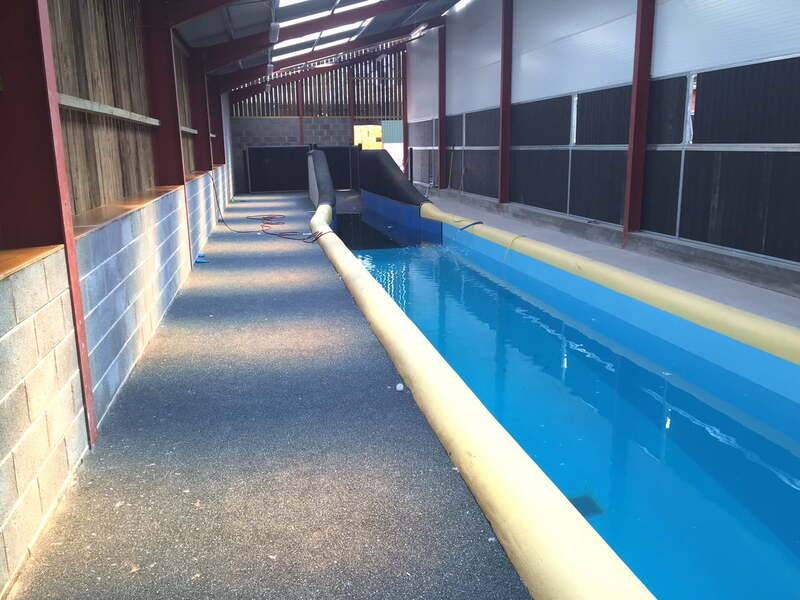 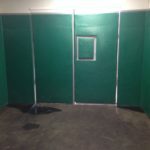 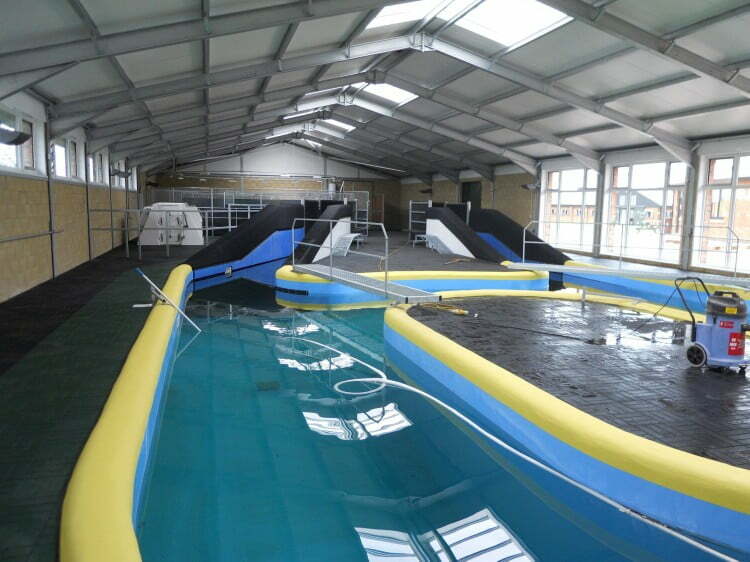 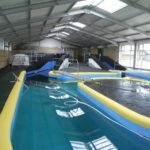 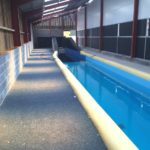 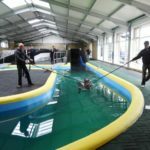 For Equine Pools and Seawalkers we can fit our padded Equiflex walling or Quattrosoft Eva Mats to the walls at the entrances and exits plus our Q/Tyle paint is perfect for the walls inside of the pools and seawalkers and comes in a large variety of colours. 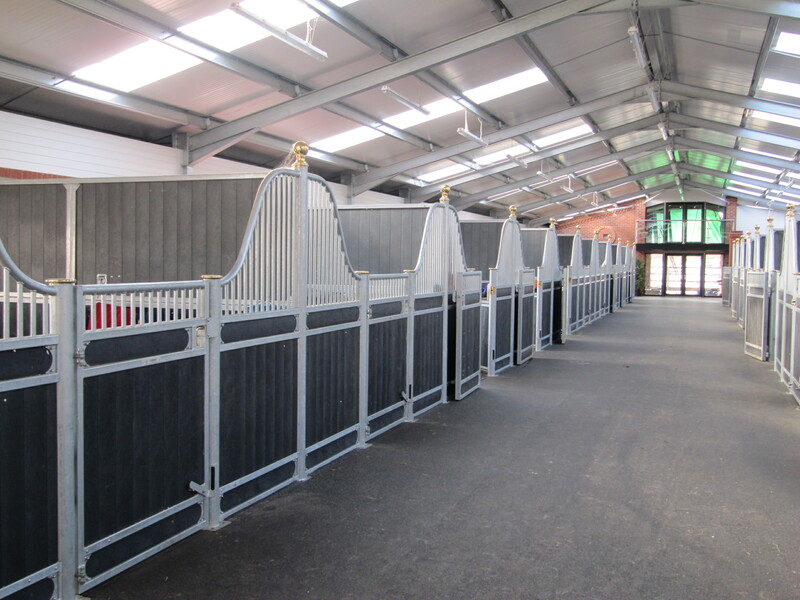 Click here for our colour chart. 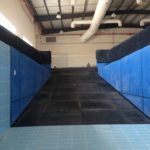 Surrounding areas and walkways to the pools or seawalkers can be covered with our Dog Bone Rubber Pavers, Brick Effect Rubber Tiles or Flexscreed. 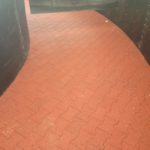 Our Flexscreed HD or Grip Top Interlocking Tiles can be applied to the exit and entrance ramps to give a hard wearing anti slip surface. 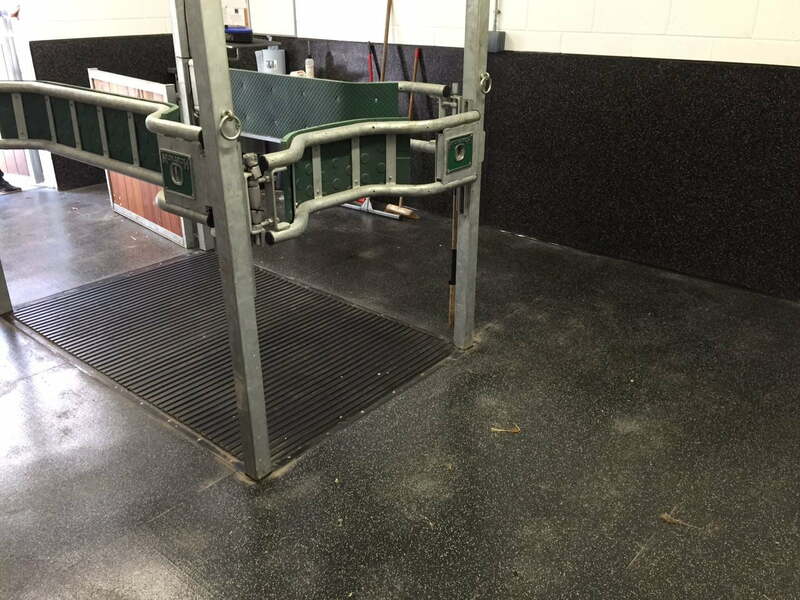 With strict hygiene requirements within the animal care industry it gives the need for stronger more permanent finishes. 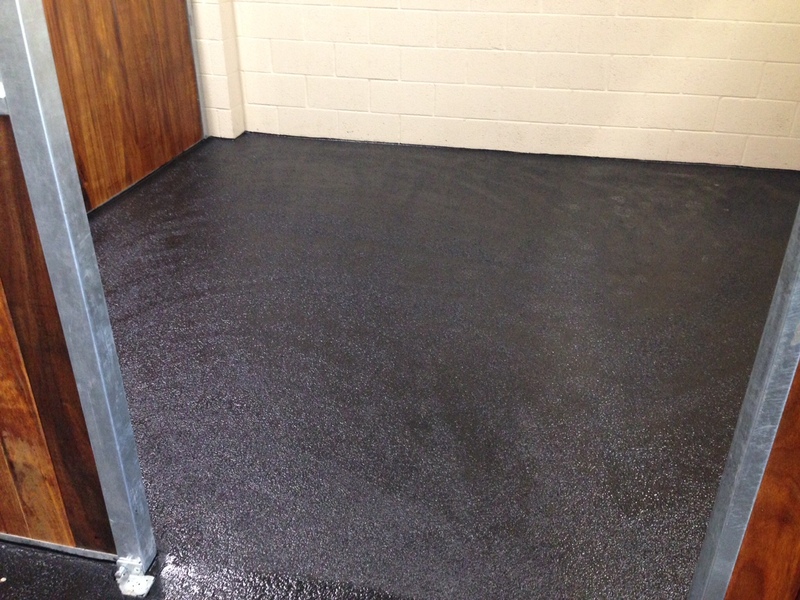 With experience in high quality rubber and resin finishes we have been able to fit the bill in most veterinary areas. 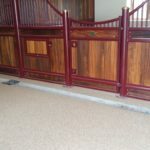 The finishes have been proved throughout the industry and are designed to give seamless, easy to clean surface that do not require continual maintenance. 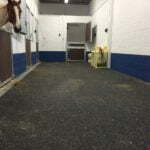 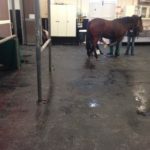 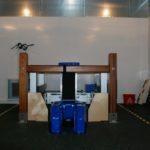 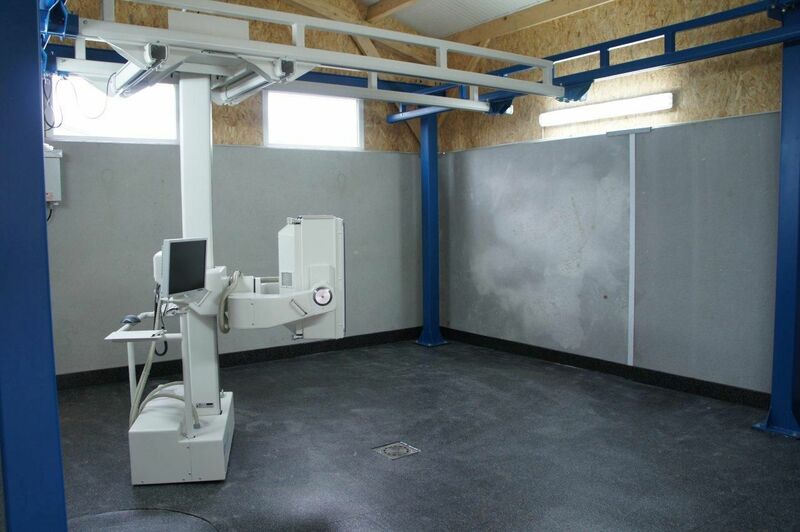 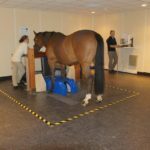 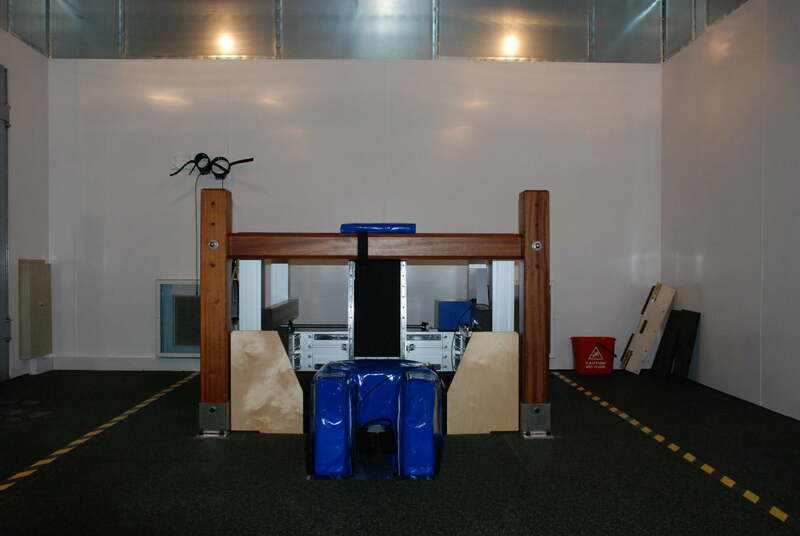 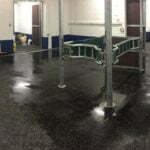 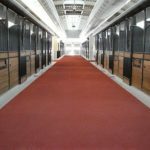 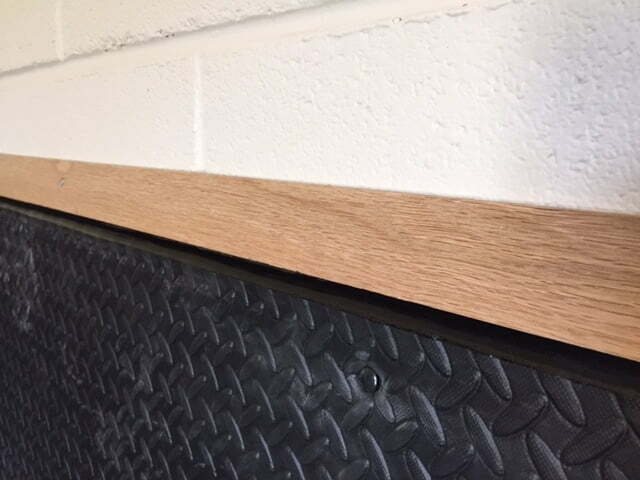 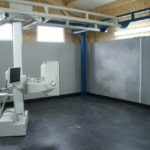 Quattro fit seamless rubber flooring and walls for Examination Rooms, X-Ray Rooms, CT Rooms, MRI Rooms, Stables and Knockdown/Recovery Rooms plus all areas used by horses. 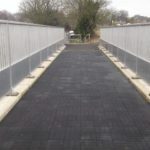 Please click on one of the materials below to see the information sheets on the products we install.